A week ago Dromara Youth surprised Shield winners, Knockbreda Youth, in the first round of the Cup, but they came crashing down to earth in the under-17 section of the Lisburn junior Invitational League on Saturday when they were hammered 6-0 by the same opponents. UNDER-13: Hillsborough 1, Chimney Corner 2; Lisburn Dist 6, Carrick 0; Windmill 2, Ballymena 1; Lurgan 1, Willowbank 0; Greenisland 1, N. End 1. UNDER-14: Lisburn Dist 2, Warrenpoint 3; Bloomfield 1, Downpatrick 1; Windmill 1, Lisburn Y 2; Portadown 4, Lurgan 0; Shankill 5, N. End 3; Ox Sunnyside Colts 1, Ox Sunnyside 1. UNDER-15: Greenisland 1, Lisburn Dist 6; Newry 1, Donegal Celtic 6; N. End 0, Carrick 6; Ox Sunnyside 3, Ballyclare 0. UNDER-16: Lisburn Y 0, Greenisland 2; Lurgan 0, Downpatrick 4; Midway 1, Banbridge 5; Hillsborough 0, Ridgeway 5; N. Belfast 2, N. End 1. UNDER-17: Hillsborough 0, Willowbank 1; Dromara 0, Knockbreda 6; Lisburn Dist 2, Carrick 0, Lurgan 0, Bloomfield 6; Newry 2, Banbridge 1. GLENMORE: 9.30, Ballymena v Lisburn Y u13, Carrick v Lisburn Rgs u13; 11.15, Lurgan v Lisburn Y u14, Windmill v Warrenpoint u14. BARBOUR: 9.30, Willowbank v N. End u13, u16, Willowbank v Hillsborough u17; 11.15, Chimney Corner v TW Braga u13, Greenisland v Newry u15, Lisburn Rgs v Lisburn Dist u16. FULLERTON PARK: 9.30, Greenisland v Hillsborough u13. MOIRA: 9.30, Lisburn Dist v TTBS u13, Ballyclare v Windmill u15; 11.15, Portadown v Ox Sunnyside Colts u14, Camlough v Lurgan u17. LURGAN: 9.30, Windmill v Lurgan u13. WALLACE PARK: 9.30, Armagh v N. End u14, Donegal Celtic v N. End u15, Greenisland v Lurgan u16; 11.15, Shankill v Ox Sunnyside u14, Carrick v Lower Maze u17, Dromara v Lisburn Dist u17. ORANGEFIELD: 9.00, Bloomfield v Lisburn Dist u14. BALLYMACOSS: 9.30, Ox Sunnyside v Carrick u15, Downpatrick v Midway u16, Bloomfield v Newry u17; 11.15, Lisburn Dist v Hillsborough u15, Hillsborough v Lisburn Y u16, Ridgeway v N. Belfast u16. Ballymacash YM closed the gap on Warren YM at the top of the Premier Division when they won the only game in the division 7-2 against Lambeg Rangers. James Thompson and Jordan Johnston both got two of the goals and the others came from Chris Edgar, Ryan Graham and Stephen Scott. It is a two way battle at the top of Division 1 between Ballymacash YM II and Braniel YM II. Ballymacash beat Victoria Athletic 3-1 with goals from Stephen Tierney 2 and Eddie Murdock. Proctor Carberry replied. Braniel were 5-0 up against Bloomfield III but had to settle for a 5-3 win. Cregagh Wanderers returned to winning ways with a 5-1 success over Belvoir FC II. Scorers were Graham Montgomery 3, Phil Davidson and Michael Morris. Paul McKee, Brian Houston, Dee Rules and Mark O’Rawe scored the goals for Colin Valley III in a 4-1 win over Clonduff YM II. Warren YM II stayed top of Division 2 after a thrilling 4-3 win over Moira Albion II. James Lyness got two, Roy Hamilton and Jordan Cairns of the Warren goals. South Antrim II were 5-0 winners away to Lambeg Rangers II. Gareth Oldroyd got both FC Utd Lisburn II goals in a 2-0 Gordon Hanna Trophy first round win over Clonduff YM III. In the same round FC Utd Lisburn had an 8-0 win over 1st Lisburn II. Scorers were Tommy Roy 3, Simon Hall 2, Andy Doran 2 and Ross Phillips. Braniel YM were 6-2 winners over South Antrim in the second round. Stevie Robb 4, Lewis Irwin and Nathan Speers got their goals. Jason Hamilton and David Irwin were the scorers in Warren YM’s Group A 2-1 win over Belvoir FC and the Glaston v 1st Lisburn match was off due to a death. Terence Morrison 2 and Chris Graham got the goals in the second-half when Sandy Row beat Clonduff YM 3-0 in Group B.
Ballymacash YM III and Glenavy III fought out a 1-1 draw in Group A with Harrison Gibson scoring for Ballymacash. In Group B Carrowdore YM had a 3-1 win away to Ballymacash Rangers III, whose scorer was Andrew Jackson. PREMIER DIVISION: Clonduff YM v Warren YM. DIVISION 1: Belvoir FC II v Braniel YM II. DIVISION 2: Glenavy III v Moira Albion II. GORDON HANNA TROPHY, second round: Ballymacash YM v Ballymacash Rgs III, FC Utd Lisburn II v Glaston. Quarter finals: Braniel YM v Ballymacash YM II, Colin Valley III v 1st Lisburn. SUPPLEMENTARY CUP: Group A: FC Utd Lisburn v Belvoir FC. Group B: Lambeg Rgs v South Antrim. SUPPLEMENTARY PLATE: Group A: Cregagh Wand v Clonduff YM II. Group B: Orangefield OB III v Bloomfield III. WHITESIDE CUP: Group A: Clonduff YM III v Warren YM II, 1st Lisburn II v Ballymacash YM III. Group B; Newtown Forest III v Lambeg Rgs II, Carrowdore YM v South Antrim II. 1st Lisburn Blues supporters club will be running a bus from their Sackville Street clubrooms for Linfield’s match against Portadown tonight (Friday). Clubrooms open 6.00pm. Bus leaves at 7.00pm. Saturday brought a big clash in Round 4 of the NIBFA Cup where Linfield FC took on Lisburn Youth FC at U13 Level. 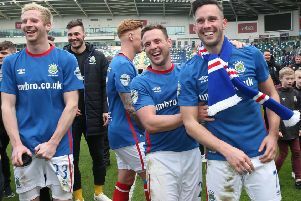 Linfield, sitting top of the National League and after beating Glentoran in the previous round, were most likely the favourites going into this game full of confidence. However, current Lisburn League champions and providing games in hand are won, current Lisburn league leaders, Lisburn Youth were also in fine form going into this tie. Linfield looked sharp on the ball in the opening exchanges of the first half, although this was short lived as Lisburn Youth got into their stride and started to dominate proceedings. In fact Lisburn could have been two up after 10 minutes after two long range efforts from Richie Patterson grazed the Linfield crossbar. It wasn’t long after that however, that Lisburn Youth took the deserved lead thanks to a wonderful whipped free kick from the left foot of Adam Donnelly that curled into the top corner. Lisburn almost added a second three minutes later after Ross Hunter latched onto a bouncing ball and struck it on the half volley from 25 yards that smashed against the Linfield crossbar. Had it been two inches lower, we were surely witnessing one of the goals of the season. It was Patterson’s shot that was parried by the Linfield keeper two minutes before the half that fell to Nathan Millar who kept his composure and slotted the ball home to make it 2-0 Lisburn Youth at half time. Even with a bit more pressure from Linfield in the second half, it was still Lisburn Youth that looked the more likely and threatening on goal, with Faulkner’s pace and Donnelly’s trickery creating chances. As time ticked, both teams were still producing football that was a joy to watch, and Lisburn Youth put the tie beyond reach with two superbly taken goals from David Faulkner, both set up by Hunter who showed great vision and calmness most notably for Faulkner’s second to slide the ball into his path to allow Faulkner to turn and shoot in one movement and fire the ball into the far bottom corner. Lisburn Youth march on the quarter finals of the NIBFA Cup after this well deserved victory and credit must go to Linfield FC for their part in a great game of football that impressed many onlookers. Lisburn Rangers Youth took on Oak Athletic in a big game for both sides, with a place in the quarter finals of the NIBFA Cup awaiting the winner. It was this stage last year when the two sides met with a comfortable victory for Lisburn, this was maybe the reason why Rangers started with a complacent attitude. This was a better Oak side and were happy to take advantage of Rangers’ poor start, with pace and sharp passing they went 0-1 up but Rangers still weren’t ready to put themselves forward and after fifteen minutes it was 2-0, the match was passing Rangers by with the risk of being over by half time. Oak kept on pressing and it was a slice of luck on Ranger’s side when Oak rattled the woodwork twice in five minutes. The breakthrough came when Josh McMaster found the net from a free kick just outside the box. Half time - Lisburn Ranger’s 1-2 Oak Athletic, game on. The second half started with Rangers on the front foot and not prepared to let Oak grab a third and finish the game. Rangers kept the pressure on and the reward came when Thomas Burns headed over the oncoming keeper to make it 2-2. Rangers pushed hard and were given the chance to win it with five minutes to go when they were rewarded a penalty for a foul in the box, top goal scorer Lee Hutton stepped up but drove the ball over the bar. It seemed luck was now on Oak Athletics side and it could be there day, full time 2-2. Extra time and penalties if needed but Rangers wouldn’t want that so with tired legs they dug deep to find a winner within the next twenty minutes and full credit to them with only one sub and a few boys not fully fit they kept the pressure on and when the ball fell to Kurtis Gillespie in the box he made no mistake with a placed shot passed the keeper, 3-2. It was Rangers who got a fourth when Lee Hutton fired home from close range, final score 4-2. Wesley Football Club is on the lookout for a new manager to re-build a team for next season. The job will start now with the task of building a team. Wesley Football Club goes back to 1955 and has played in both the Lisburn League and in the Northern amateur League. Anyone interested in the post please get in touch with the committee of the club on 07740944487.